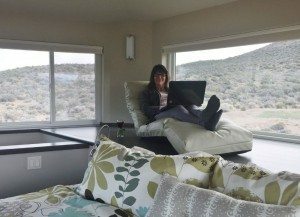 In October, 2014, my husband Greg and I moved into the first holistically sustainable Haven™ model home by Envirohaven™, built by Suncrest Builders, Inc. on the outskirts of Reno, Nevada. Greg and I have been a design-build team for most of our 35 years of marriage. When he came to me to share his idea of a home that could be hyper-efficient in the way it uses energy and space with 30% fewer materials than other homes we were building, I was the skeptical, but of course I wanted to be supportive. I understood as well as he did that if it is possible to create a comfortable, green home with less materials, sustainable living would become much more affordable and available to average homeowners! We both share frustration with the “Green” building movement in that it has tends to focus on the trees instead of the forest. 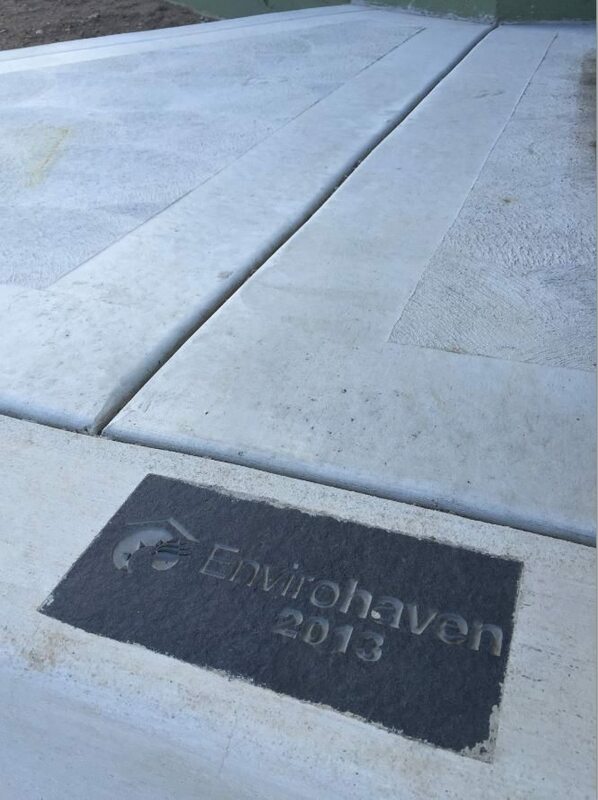 Every Haven™ Sustainable Home has an Envirohaven™ plaque. After many long discussions, we agreed that if Greg could get an engineer to sign off on his idea, we would try to get it built. Greg was always a fan of geodesic domes, in theory. The promise of more enclosed living space with less surface area exposed to the elements is extremely appealing. Add to that the inherent strength of a dome and it could appear to be a dream come true. But the pitfalls of geodesics have become painfully evident. Those wishing to live in one can find it difficult to find a contractor, get insured, and financed. It was easy to understand that if this concept could be proven valid, we could provide a home to people that would offer the benefits of a geodesic dome without the pitfalls. It truly could be a dream come true for people desirous of creating a more sustainable lifestyle without the premium price tag. Greg’s idea was natural progression of what we always have tried to do for our Suncrest Builders clients; provide more with less. It took just about 3 years for us to see his brilliant idea come to fruition. Moving in was like a dream for us. The interior design of the home is a fun contempory blend with a Mid-Century Modern essence. Just like the Haven™, the design is fun with a slightly quirky twist! Downsizing as empty nesters from our 4000sf. home of over 20 years, we spent many hours planning how to maximize the potential of the essentially 2000sf. interior space. In future articles, I’ll speak to many of these space saving design features that have been built into our Haven™. It’s impossible to articulate how simply comfortable and easy life in the Haven™ is. Throughout this past winter, we found that keeping the temperature in the mid 60’s day and night, required little effort. Granted, our winter in Reno this year was unseasonably warm, but night time temps still dipped below freezing on most nights for the first 6 months after we moved in. During that time, we only used the furnace twice. The first was to satisfy our curiosity that it worked. The second time was over Christmas when our new baby granddaughter was staying with us and we left it on as a precaution for her. We now have thermometers everywhere to monitor daily temperature swings. As it turns out, the downstairs “back” bedroom does not get any more than a couple of degrees cooler than the rest of the home. 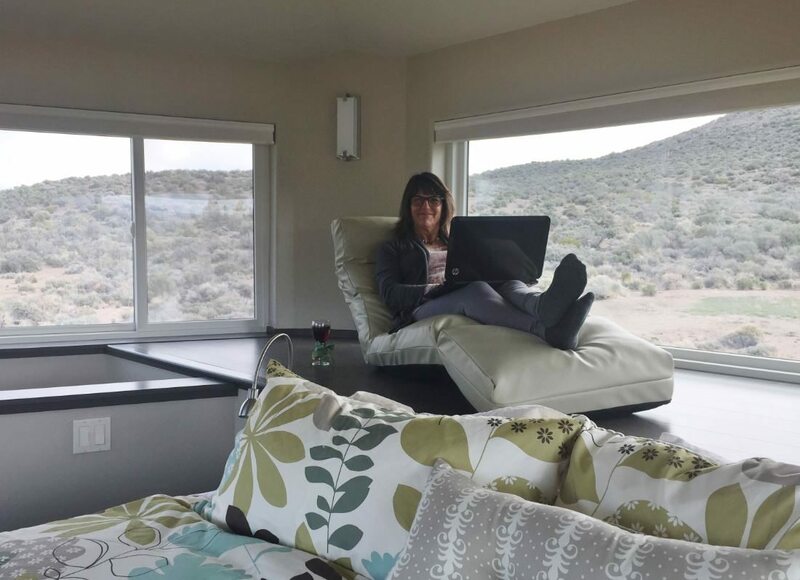 Sitting in the spot you see me now in the photo reading and writing while being able to have a birds eye view of the neighborhood; the horses running in the wind, the mountains as the storm comes down the hill, and the birds flying by at eye level. Falling asleep looking at stars right outside my window. Waking up to see the sunrise as it creates color, 360 degrees around my bed. Listening to music; the acoustics are AMAZING! It’s hard to stop wanting to look outside during full moon nights. We need less because our major spaces and the furniture in it is multi-purpose. Less is more. It just feels good in our Haven™. Maybe due to conformance with the Golden Ratio? In the coming weeks, either Greg or I will post a short essay on one particular aspect of living in our Haven™; our adjustments, our discoveries, our joys. If you’re interested in sharing your experiences in living off-grid or a sustainable lifestyle, we would love to hear from you. Please subscribe to our website so that you are notified of when we post new blogs on Living In A Sustainable Haven™!